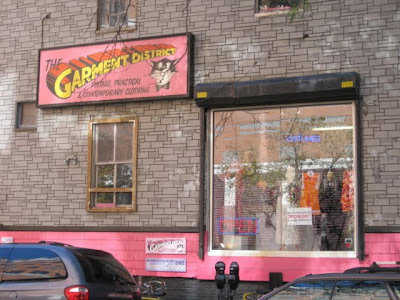 A couple posts ago, I promised y'all a trip inside the Garment District in Cambridge. Since that was, errr, a month ago at least, the trip in question has long since passed, but I went again yesterday and can visit the subject now! 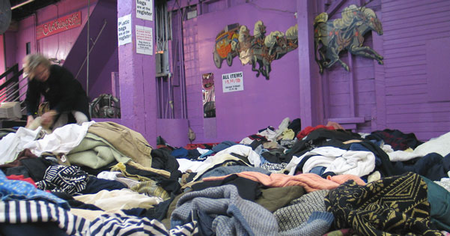 The Garment District is an "alternative department store"/large vintage and thrift store that shares No. 200 Broadway in Cambridge with Boston Costume. It has a large selection of 40s-70s vintage (of varying levels of quality, wear, formality, etc--not always the best organized, but that's half the fun right?) and general thrift/secondhand stuff, as well as a small selection of new things and jewelry. I love going in there and poking around for clothes--but its real strengths, for me, come in three areas: Shoes, Strange Accessories, and Dollar-A-Pound. This hat is AMAZING (I think), plastic ribbon woven into wide strips that are then woven to make the hat shape. The bow on the side is wired ribbon in some velour-y material and is desperately stained, but that'll be easily either cleaned or replaced. 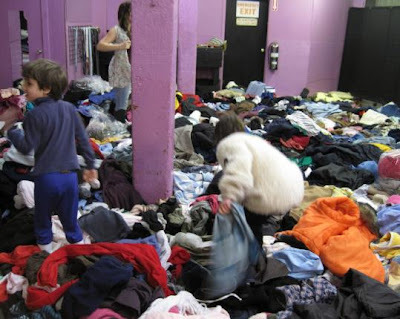 You root around in the pile (and the accessory bins around its edges), an adventure that can last hours if you let it, and leave with a pile of clothes, shoes, belts, whatever, which is then weighed. You pay $1.50 per pound. On Fridays (if, unlike me, you're early enough to make it! ), that's $1. Last time I went, I came away with three blouses, two skirts, a belt, a sweater, and shoes, all for $9-something. Dollar-A-Pound: the Source of My Entire High-School Wardrobe. After the shopping excursion, I went to see a friend's band, the aaawesome Love Experiment, play; my ears and dancin' feet came away very happy. The band that opened was called China Fox and were also really sick! Altogether I think I succeeded at Yesterday. Coming Up Soon: the Great Repainting of My High School Bedroom, more Cover Stories (you lucky, lucky people), possibly even some actual sewing news? Eh? Eh?